We are open daily M-Tu-Th-F from 9:00 am until 4:00 pm; Wednesday, 9:00 am until noon. We are open on Saturday’s for Recruitment from 2:00pm until 6:00pm. Week ONE TUF specials include the ‘Make Me Smile’ arrangement; your choice of sunflowers or gerbera in colorful vase. Can be designed in a McCartys Pottery vase. TUF goodie baskets are a great pick me up after a long day of recruitment. TUF ‘De-Stressers’ are MSU tins filled with Musee bath bombs and Pass Christian Soaps . Mylar balloons can be attached to any order. We have Wolfe Birds, scarves, apartment-wares, and great MSU tailgating pieces. Stop by 100 Lee Boulevard located in the center of campus and see TUF for yourself! If you want to send throughout the week of Recruitment, ask about our 3 or 5 day delivered flowers and gift plans. On Bid Day, just call 662-325-3585, let us know which sorority your daughter has joined, and we’ll deliver her new sororities’ flower to her! The shop will be open at 2:00 pm, and we will stay until the last delivery is made to the sorority house! 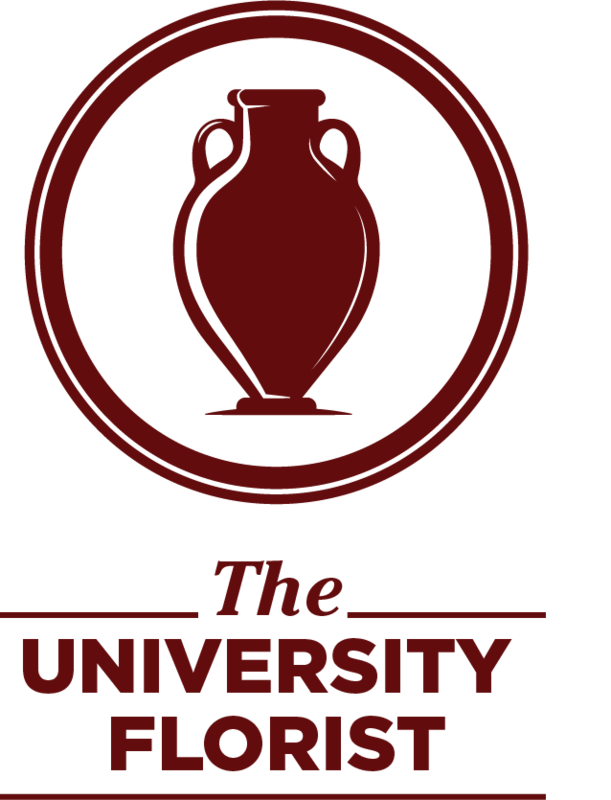 TUF offers two sorority vase designs. Our floral designs are unique and represent all of MSU’s sororities. These pastel mixes are available in two sizes: starting at $20.00. We have a variety of florals available; inquiries can be made by email to info@theuniversityflorist.com.